Finn Mortensen watching Hal Clark programming the Buchla Music Box, NSEM, November 1976. Source. Composer, sound designer and curator/researcher. Born Harold Clark in January 1949 in a farm town in Nebraska, US. He studied music composition at the University of California, Oslo Musikkonservatorium with Finn Mortensen and the University of York, U.K. Studied bass with Bert Turetzky. In 1971 he moved to Norway from San Francisco to carry on his musical studies and career. In 1972 he was hired as a producer and tonmeister at the Henie Onstad Art Centre at Høvikodden. Here in 1975 he co-founded the Norwegian Studio for Electronic Music (NSEM) together with the late composer Arne Nordheim. 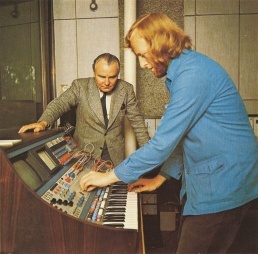 Meeting with young Norwegian composers in regular salon-workshops and bringing with him the influences of the renowned San Francisco Tape Music Centre (studied with Robert Erickson), Clark commissioned technology artist Don Buchla to incorporate his series 502 digital-analog hybrid electronic instrument design into the completion of the NSEM studio in 1974. It was considered one of the foremost advanced instrument inventions at the time. He has performed with various orchestras and ensembles (eg. Muskap), worked with composers Arne Nordheim and Mauricio Kagel. As a researcher, he has written Steps to an Ecology of Contemporary Music, inspired by anthropologist Gregory Bateson. Clark left Norway after 10 years and now lives in Vancouver, Canada. (Source). Hal Clark, Steps to an Ecology of Contemporary Music.